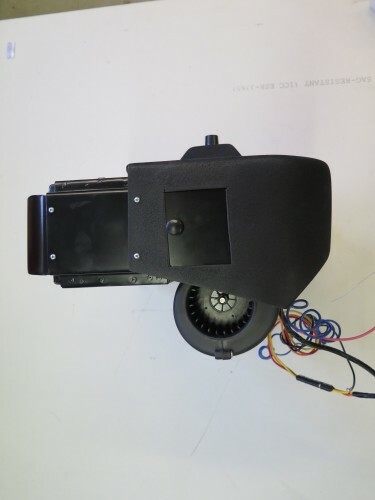 This summer we had to repair a A/C Evaporator on a 1970 Ferrari Daytona so we thought it would be a good idea to copy the housing and make a “replica” unit. The original part had some very thin plastic which we remade in aluminum, otherwise this is a direct copy of the original. This unit is complete with the core, blower, fan speed and temp controls, knobs, ID plate and little side doors for floor cooling. The main facia was originally a molded plastic piece but we made this one out of aluminum with black wrinkle finish paint which looks nearly identical to the original. At this time, I could probably re-make the part in plastic but need a perfect part to make mold. Many Daytona’s were converted into competition cars in the past and things like the A/C components and other extraneous parts were taken out and thrown away. With Daytona’s becoming more valuable, some of these converted cars are being returned to their original configuration and need the A/C parts re-fitted. If you need any help with A/C parts or a gasoline vapor canister (Charcoal cannister) please let me know, I may be able to assist you. I’ve got the A/C hose, hose ends and other components for A/C equipped Ferraris from the mid 1960′s to the mid 1970′s. It was a busy day yesterday with the guys hustling around the shop to keep what seems like 1000 going at any given moment. 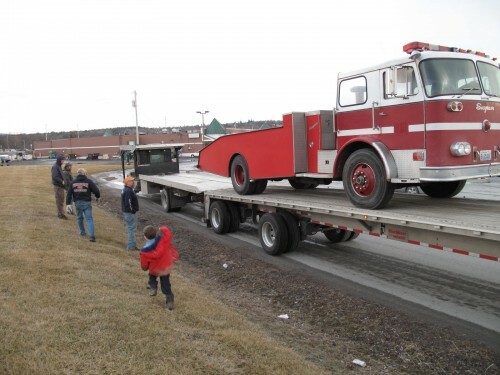 We finally got the Porsche 356B body shell out of the back lot and en route to Georgia. 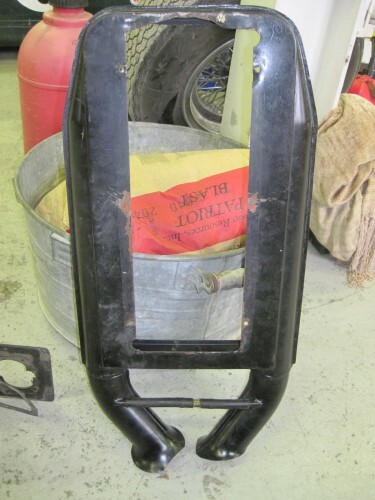 Nate and I were going to put the longer forks on the Skid Steer loader but since we couldn’t find them we just used the shorter forks which worked just fine, reaching the upper level of the truck with ease. I pity the fool who has to take this lump off when it gets to GA! Rolf is managing the Maserati Ghibli project which means getting all kinds of parts sent off to the sub-contractors for various things like plating, rebuilding, etc.. We are sending the interior panels to Italy for upholstery while our local guy is going to replace the top and carpets. Nate is assembling a Ferrari Lusso engine, we finally got the correct piston rings and a new high tech piston ring grinder with dial indicator, super trick. 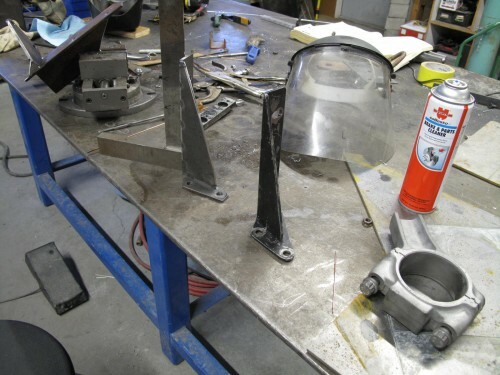 He is also getting all sorts of parts painted on the Ford 8N project and has assembled the transmission and final drive and put them in epoxy primer. He found the correct shade of red in PPG acrylic urethane aka “Concept”. Eben is contemplating how nearly every part on the Maserati Ghibli project car is damaged or hacked up. 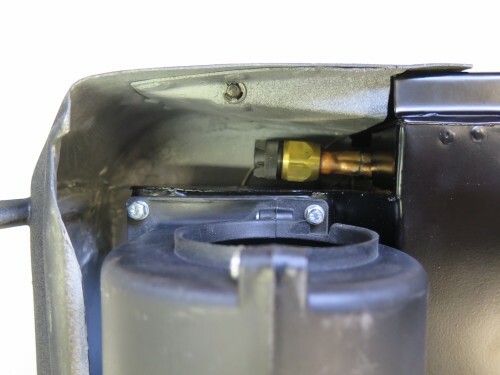 The bolt holes for the seat tracks are broken here and there, a threaded ear on the brake pedal is broken, and the air cleaner housing has been hacked up at the top for some reason. Why would someone go after this area with shears? Maybe once I get the entire car together it will become evident. Casey and Syl worked the day on the blue 365 GTC/4, installing the front and rear glass and polishing a few odd marks out of the paint. Casey spent the week getting all the A/C hoses routed and other things together on this car that’s been apart for way too long (embarrassingly long time). I dropped my kids off at school and picked them up later in the day. I also bought and sold the Jaguar XKE Roadster. 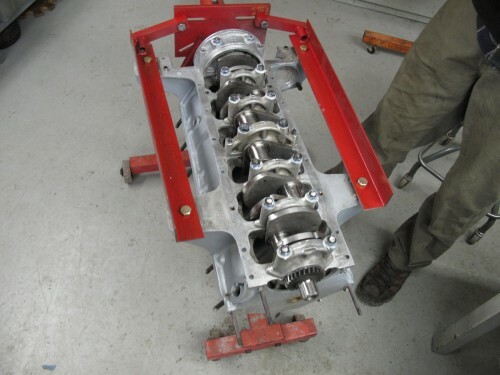 I also packed up a complete A/C kit for a Ferrari 330 GTC in a huge and heavy box and developed a lead on a Jaguar XKE Series I 2+2 and a XKE Series 1 3.8 liter Coupe. A friend stopped in and we discussed all kinds of cars he has for sale, an Alfa Sprint, Lancia Flaminia S.S. Zagato, what else… He is looking for a Jaguar XK-12o Roadster and a Ferrari 250 GT PF Cabriolet S-II. Our Bookkeeper Johanne was busy keeping our shop up to date with US Gov payroll status and all the million other bills she keeps on top of. Peter was making some part, I just can’t remember at the time of this post… He was getting all the paperwork together for a Ferrari that we just sold. 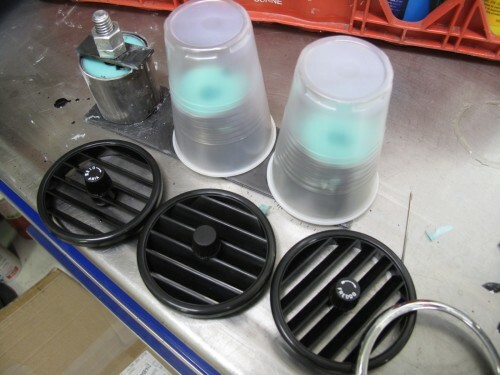 The orders keep coming in for A/C systems for 330′s so here are some photos of the process. The top photo shows the fabrication of the compressor brackets which use extremely thick steel as a substitute for proper engineering. We joke that well before the brackets are going to flex or distort, the studs that secure them to engine will break off. Anyhow, we copy parts accurately but can see that they are way overbuilt. 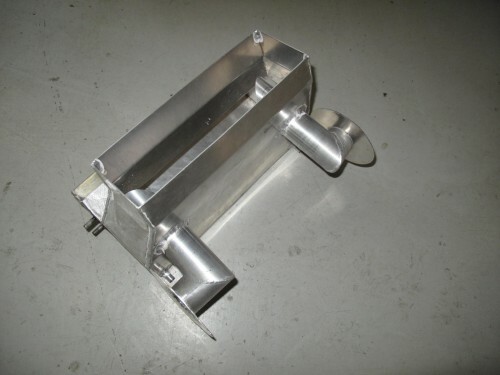 We also make the evaporator housing which holds a very dense core and squirrel cage fan. 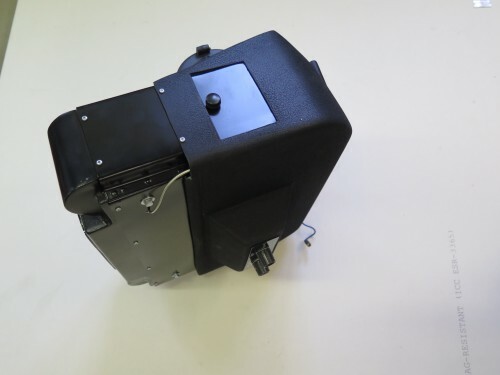 The original housing is made from steel but we make it from aluminum since it’s so much easier to work with and the part has a bunch of bends and needs huge holes drilled in the sides. Since the part is buried under the dash, no one will ever know the difference especially if we give it a coat of light gold paint. 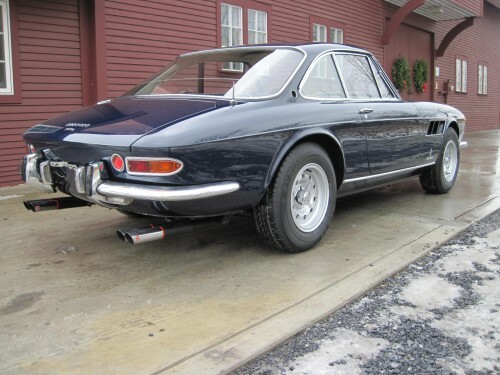 A California man is the proud new owner of the 330 GTC that was in a post a month ago, http://www.ferraricraft.com/2009/12/a-nice-photo-of-a-330-gtc-that-we-have-for-sale/ and now it is time for me to market another dark blue GTC. 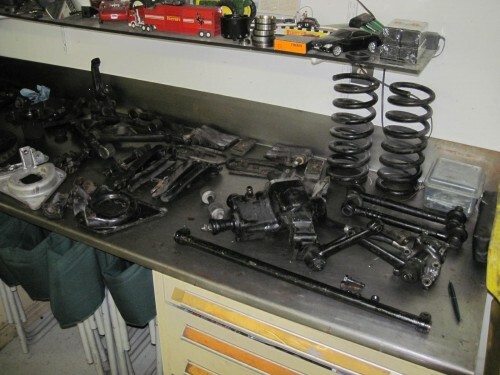 Similar to the last car we sold, this one had lots of cosmetic work done by another shop and when we acquired it, nearly every mechanical component needed attention! There was a large oil leak at the engine when we first got the car, here is what we found jammed between the timing chest and the head! Once we removed the heads, we noticed bad bearing wear, terrible sand cast “el-cheapo” pistons and a plugged up cooling system. Needless to say, now the engine is completely overhauled and after a few years and 2-3000 miles, it is sorted and runs beautifully. With a new radiator core, all new A/C components, axle boots, tires, clutch hydraulic components, this is an outstanding car! I have never advertised anywhere that I make Air Conditioning systems for Ferraris but somehow people continue to contact me to build a system for them. A man in CA. heard that I have the jigs and know how to get all of the parts to equip his car with a very original style system with the original type hose ends and cotton braided hose. We also built brackets for the original style York compressor. Through various contacts, I located all of these parts, sent many things off for cadmium plating and sent off a diagram on how to wire everything and route the hoses and wires. 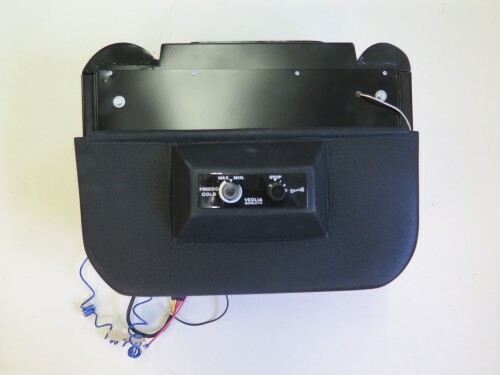 One thing that is missing to complete a system are the dashboard vents that double as temperature switch and fan speed switch. I am in the process of tooling up to re-make these vents and knobs that will work with modern replacement switches. 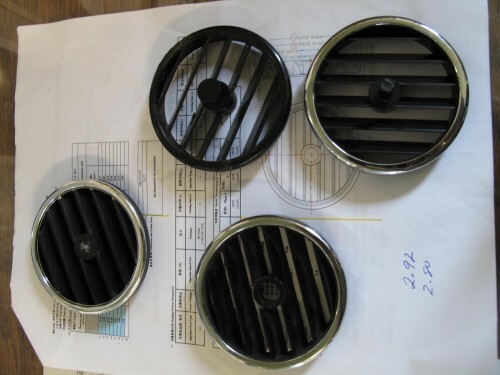 If you know anyone who needs these vents let me know. 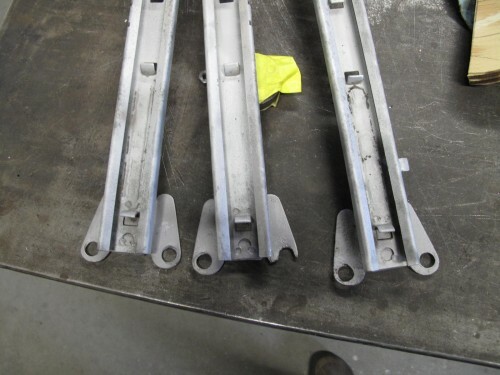 It will cost a small fortune to make the molds for these and I will also have to make the chrome trim pieces so I would like to have some interest to help out with the cost. While working to locate A/C parts for our Ferrari 330 GTS project, a man asked me to locate a evaporator for his car, a 1967 Ferrari 330 GTC that uses the same unit as the GTS. 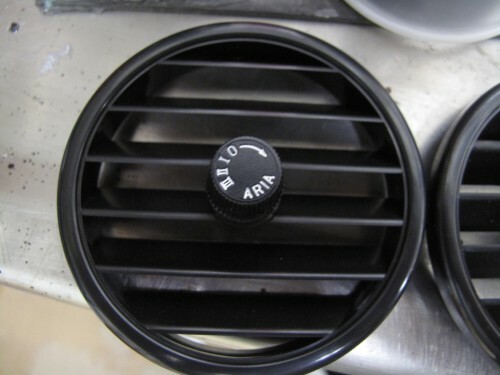 I searched all over for a unit for the GTC but I probably purchased the last OEM evaporator in existence for the GTS. 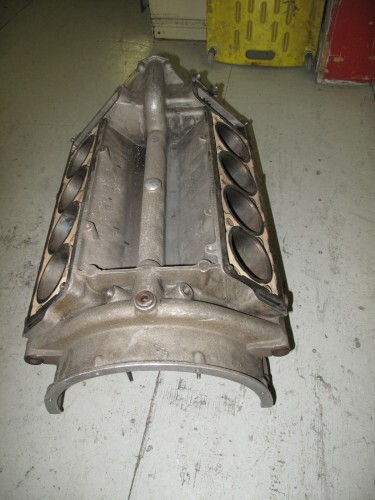 Without the OEM unit I told him that we will to fabricate one once I locate a correct sized evaporator core. We made a jig off from the original unit in order to be sure the dimensions are the same should anyone want us to make them an evaporator for there car. 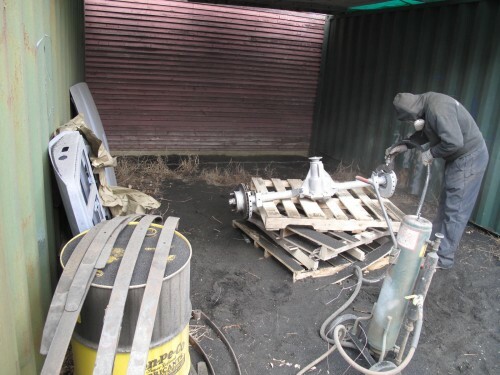 With great difficulty I located an appropriately sized core and blower (unusually thick and narrow) and we got busy fabricating a duplicate of the original. In the photos you will see that the original gold cad plated steel and the one that we made is from aluminum sheet. We will probably paint it satin black so it Disappears behind the center console of this car. 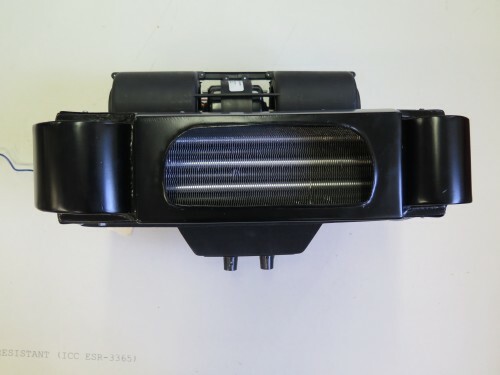 As I said above, if you are looking for a 330 GTC or GTS evaporator unit or any other Ferrari A/C advise please let me know. This blog makes it so much easier to post current projects on our site. I can manage it, post pictures and describe what is going on without having to submit everything to my wife Gillian to be uploaded on the main website. It also is a way for you to ask questions or get a discussion going. Here are some of the projects that we are working on. 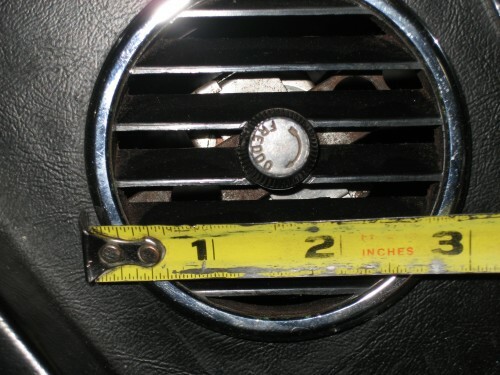 I just finished installing an air conditioning system in a Ferrari 330 GT 2+2 that had one very difficult criteria to meet — “don’t visually alter the dash or interior in any way”. 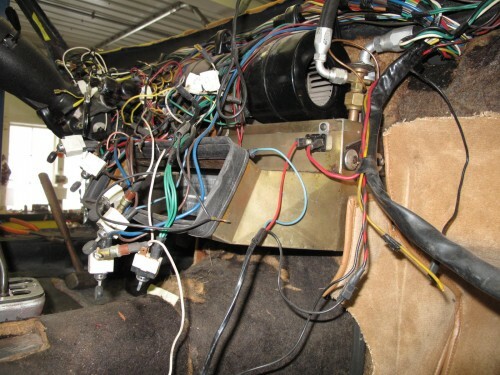 330′s that came from the factory with A/C had the row of rocker switches moved to the left of the steering column so we had to work the evaporator around a cluster of wires and bulky switches. We altered the glove box in order to provide room for ducting, but not much else was altered. I used a full modern r-134a system with barrier hose and a rotary compressor, so under the hood does not look too “period correct”. Have a look at the fabrication work to make the radiator cooling fans work and the altered glove box! At the same time, I am installing a totally period correct A/C system in a 330 GTS that did not have it new. I lucked out when I bought probably the last evaporator unit for that model. As it goes, I am making some templates to have on file in case I have to make a copy of the original some time down the road. This 330 GTS system is using the original cotton wrapped hose and correct hose ends as well as a restored York compressor. The most difficult task at hand is dealing with the fan speed and temperature control switches that double as the vent outlets. I cannot seem to find these switches/vents anywhere so I may modify the existing vents to accept modern switches but they will not have the script engraved/stamped into them. I guess this car is not going to Pebble Beach. 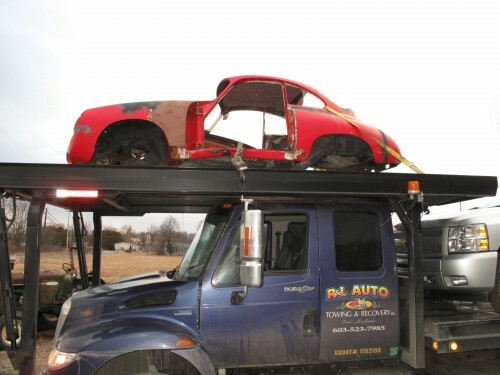 Incidentally, this same car was wrecked in the left rear. We repaired the damage and painted the car Pino Verde (pine green metallic). Copyright © 2006 Ferrari Craft. Powered by WordPress and A Dream to Host theme by Art of Blog.